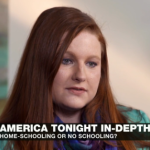 This week CRHE’s executive director, Heather Doney, was featured heavily on an America Tonight spot on oversight of homeschooling. We are pleased with this opportunity for positive exposure, and hope that this segment will introduce viewers to the need for homeschooling reform. Note: While the videos have been temporarily removed from the site, the news article covering the same content is still available and can be viewed here.